Calculating your estimated tax payments isn’t nearly as difficult as it may seem from a glance. Even though estimating your taxes might seem a little bit intimidating if you’ve never done it before, it is actually quite simple once you learn the fundamentals. The following are some of the most important things to keep in mind if you want to learn how to estimate your taxes to pay the right way. The first key to understanding what you’ll owe in taxes is to know what your filing status is. Your filing status is based on what your family situation or marital status is. There are five fundamental different kind of filing statuses: surviving spouse or currently married person filing separately from the spouse, head of your own household, a widower with children who are dependent, a married person filing together, or a single individual. After you have indicated what your filing status is, the next step of the process is to estimate all of your exemptions; the exemptions that you will file will depend on your filing status, which will dictate whether you list only the exemptions for yourself, your dependents, or the spouse that you are filing jointly with. After you have entered whatever the exemptions are for yourself, your spouse, and/or your dependents, the next step is to enter your taxable income information. Following the income information comes all of your permitted deductions and tax credits. 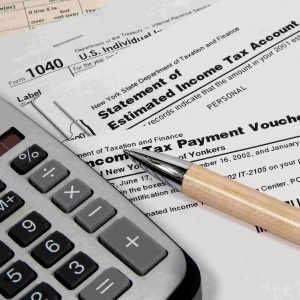 Following the filing of any deductions and tax credits, you should be just about done. Depending on the platform that you choose to file your taxes through, you may be able to see a number displayed that changes in real time to match your estimated taxes to pay as you volunteer more information. In addition to whatever you expect to owe in taxes, you also have to pay close attention to your amount refundable and withholding credits. If your refundable or withholding credits are expected to be less than what ever is the smaller of either 100% of the tax on your prior return, or 90% of whatever tax is estimated for the current tax year, then you will have to make the estimated tax payment for the current tax year. An essential starting point for anticipating your estimated tax payments is to be aware of the income tax brackets. Between 2015 and 2016, the tax rate for single filers was 10 percent for those with taxable income between $0 and $9225, 15 percent for those with taxable income between $9225 and $37,450, 25 percent for taxable income between $37,450 and $90,750, 28% for taxable income between $90,750 and $189,300, 33% for income between $189,300 and $411,500, 35 percent for income between $411,500 and $413,200, and 39.6% for anyone with taxable income above $413,200. Income tax brackets for all other filing statuses besides those filing as a single individuals can be found here on Smart Asset. There are certain conditions to keep in mind about filing taxes in order to make sure that you remain compliant. If you anticipate owing at least $1000 in taxes for the current tax year after accounting for the difference between payable taxes and any refundable credits/withholding credits, then you likely have to make whatever tax payment estimate is projected. Be aware that certain exceptions may be applicable depending on what your occupation is. Some of the occupations for which special exceptions may be made for tax payments include nonresident aliens, taxpayers of a higher income, household employers, fishermen and farmers.